With complete Facebook Integration, Rosy lets your clients schedule appointments directly on your Facebook business page. Social media is a powerful way to connect with your clients and the community. Rosy is your partner for social media success. Interacting with your clients has never been easier! Share your salon specials and notify clients of openings in your schedule. 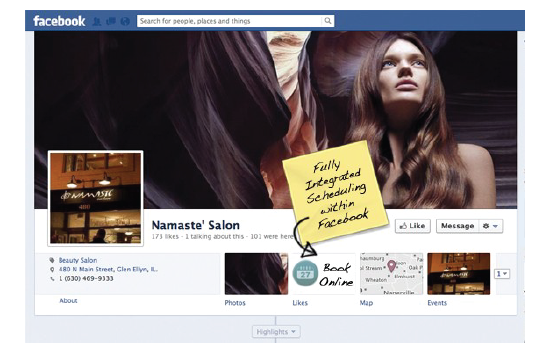 With Rosy Facebook integration, your clients can fill the cancellation themselves through your Facebook page. Complete Facebook integration, coupled with Social Media Marketing, increases your business’s efforts to create content that will attract attention, while encouraging customers to share within their social network.